Coastal Alaska lives with the most serious tsunami risk in the United States. Historically, tsunamis generated by earthquakes in Alaska have caused damage and loss of life along the West Coast and across the Pacific. Here in Alaska, though, tsunamis generated by nearby earthquakes represent “near-field” hazards. In other words, people have minutes rather than hours to reach safety. The Earthquake Center works to make our coastal communities safer by providing state and local officials with the best possible information for addressing the tsunami hazards faced by their communities. Click on the map at right to explore our interactive mapping interface. Zoom to your area of interest by selecting a community and map type. You can also toggle between map and satellite views at the top right. At present, the interactive map includes flow depths and inundation boundaries for 21 at-risk communities. In partnership with the Alaska Division of Geological and Geophysical Surveys and the Alaska Division of Homeland Security and Emergency Management, we evaluate and map potential inundation using numerical modeling of tsunami wave dynamics. Communities are selected with consideration to their tsunami hazard exposure, location, infrastructure, availability of data, and willingness to incorporate the results in a comprehensive mitigation plan. The maps incorporate the best tsunami science available at the time of publication. Knowing where to go during an evacuation is crucial to survival when you are in a tsunami hazard zone. But how do emergency managers and planners decide where the safe zones are and where to stage assembly areas in a community? For many years the Alaska Earthquake Center has been delivering tsunami inundation maps to coastal communities in Alaska. These maps show the maximum estimated extent of flooding following a tsunami. 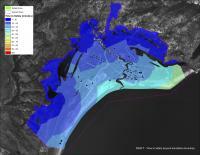 The inundation map is just a first step in helping at-risk coastal residents. A significant component of tsunami risk reduction is educating residents about potential tsunamis and preparing them for such events. Preparing a community for future tsunamis requires not only an understanding of the hazards faced, but how residents are exposed to those hazards. This can be difficult to estimate because people in different parts of a community are exposed to different aspects of the hazard, and some residents may be more vulnerable mobility issues, language or cultural limitations, or how well they are prepared to evacuate. For communities that have well-defined tsunami scenarios, it is possible to estimate the amount of time required to evacuate to high ground. These models assume evacuation by foot and include complications such as ground cover, steep terrain, and other barriers identified by the community. The full methodology is described in this overview white paper. provide response guidance in the event of tsunamis for small vessels such as recreational sailing and motor vessels, and commercial fishing vessels. The developed documents follows the draft guidance developed by the National Tsunami Hazard Mitigation Program (NTHMP) and are based on anticipated effects of a maximum-considered distant and locally generated tsunami event.